So my kids are watching National Treasure this week. Yes, it is on topic. We learned about a lot of these people and places this year. Yes, it gives me some free time 🙂 In the last 2 days I have written 8 pages in my book. YAY!! I actually had to tear myself away to write this. But I have plans all afternoon and evening and didn’t want to put this off until 9:30 PM. So here we go. Not the most original…. 10. Speed. I cannot avoid this when it is on television. I can’t say that I own a copy but I used to have it on VHS. It isn’t Keanu Reeves or Sandra Bullock or even Dennis Hopper. It’s the whole idea. I look forward to the scared lady being coaxed out of the elevator mere seconds before it crashes. I love the build up to Keanu (or rather, Jack) getting onto the bus. I love the implausible 50 foot jump on the interchange even though it makes NO SENSE that the break would be at that point. I love their escape from the bus on the trap door. I love the way Dennis Hopper “loses his head” at the end. This movie is so bad, it’s awesome! 9. Sixteen Candles- Some prefer The Breakfast Club or Pretty in Pink and I can’t deny that they are also fabulous, but Sixteen Candles introduced us to John Hughes’ princess of the 1980’s, one Molly Ringwald. On top of that, there are so many cultural references that only work in the 80’s. And there is also the fact that I was scared out of my mind that my family would forget my 16th birthday. They did not. Also, my sister was a lot less drugged at her wedding. In fact, she was not drugged at all. And Jake Ryan (swoon) did not show up in his little red sports car to rescue me from relative nightmares! 8. Braveheart– I saw this movie at the $1.50 theater in Chattanooga FIVE times. I introduced people to this movie. I cried every time he saw Murron at the end. I flinched every time the guy is thrown off of a tower and is impaled by a very pointy stick. But there is such devotion in this movie, such passion, such courage. The people of Scotland are not so much amused by this movie. They did not appreciate my questions about it when I was there. However, I have stood ON THE ACTUAL Bannockburn battlefield (more or less) 2 miles outside of Sterling. This was the battle where Scotland won their independence from England in the early 1200’s. 7. 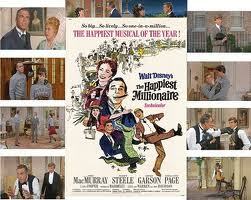 The Happiest Millionaire- Okay, I know I just lost some of you. This movie is from the mid-60’s. It stars Fred MacMurray and Leslie Carron. It is the story of a Philadephia man who marries off his daughter to the son of a Detroit Auto magnate. It is set in the 1890’s or something and it is a musical. There are pet alligators, an Irish butler who is sort of the narrator, boarding school drama. It is so good. If you have never seen it, you need to!!! I think it’s actually a Disney movie and back then that actually meant something! 6. 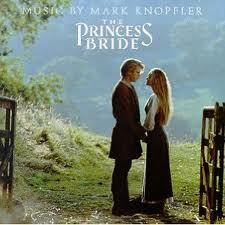 The Princess Bride– Do I really need to explain this one??? 5. The Sound of Music– Yes, it is now my sister’s life, but LOOOOONG before that it was one of the movies that we were guaranteed to be able to see at my grandparents’ house. I usually got bored once Maria left the Von Trapps the first time. Then I was back for the wedding. Then I was done again. Basically, it was all about the songs. I could sing every song and do the chorography….which is hard without 6 brothers and sisters and a governess!! 4. 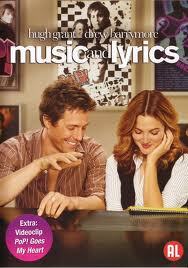 Music and Lyrics- Probably one you will have to look up. Not many people have heard of this one. It came out in 2007 and stars Drew Barrymore and Hugh Grant. Grant is the less-successful half of a former pop duo (which is comically pop up video’d at the end) who has always been better putting melody to songs and never very successful with lyrics. Enter Drew. She rocks out the lyrics. Typical rom-com antics ensue. It’s just so cute!! I own it and I will let you borrow it if you want. Actually that goes for all of the last 4. 3. 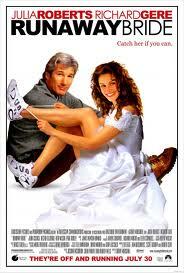 Runaway Bride- Julia Roberts and Richard Gere. With support by Hector Elizondo. Resurrecting the Pretty Woman dream team this cute, little movie is so relateable. My favorite part is the small-town names of businesses like a beauty parlor called “Curl up and Dye”. 2. Shag– Again, you’ve never heard of it. I know. Made in 1989 and set in the summer of ’63 this movie follows 4 best friends from Spartanburg, SC as they blow off the plans to go to Fort Sumter and instead spend a weekend in Myrtle Beach. A coming of age story with adorable fashions and Shag dancing- which I would LOOOOOVE to know how to do!! My friend Jenn and I quote it all the time! 1. 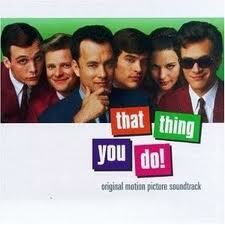 That Thing You Do- Tom Everett Scott. The cutest, shades wearing drummer of all time. And he’s polite too. He rescues poor Liv Tyler from her mean boyfriend. And Tom Hanks is their manager. And he directed. And the song is catchy. And they wear matching suits. And Lenny is hilarious. My friend Erin and I quote this movie all the time. So there you have it. My top 10 movies. I thought long and hard about this list. These are all movies that have been out for a while and have stood the test of time, at least for me. I would invite you to check out those you are unfamiliar with. Kindred spirits…. I will also watch just about anything with Drew. Also Julia Roberts, Reese Witherspoon (although I had NO desire to see her latest one) and Kristen Bell.